It should come as no surprise to anyone that Singapore is a major leader on the global scene when it comes to the field of robotics and advanced technology. For years and years now, this nation in Southeast Asia has been working hard to come up with a rock solid foundation in the fields of technology and information, making it the bedrock of their economy and their future. This investment has paid off considerably in the form of major leaps forward as far as their GDP and their overall wealth and influence on the global scene is concerned, but it’s also allowed them to really helped to pioneer exciting new technology like Edgar, maybe the world’s most famous robot right now! 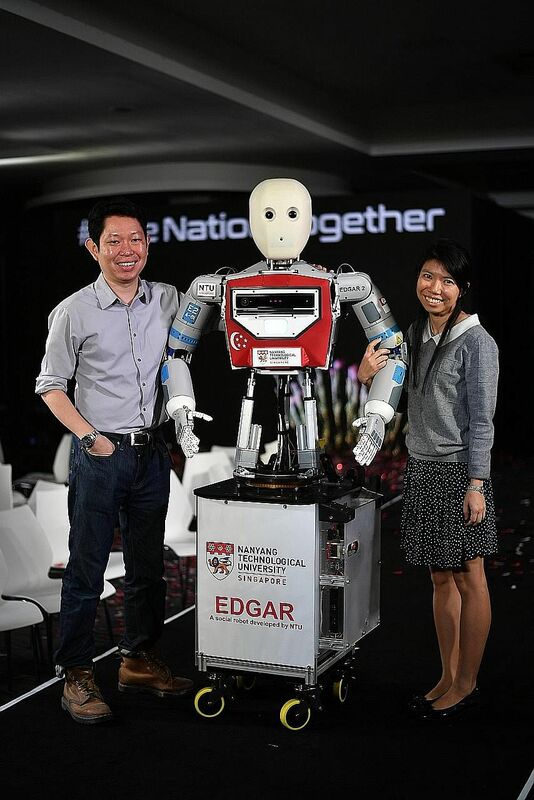 With a crystal-clear voice, the ability to talk about anything and everything imaginable, and a tremendously human appearance with the ability to create more than 150,000 individual facial expressions, Edgar is one of the most advanced robots ever produced and he will be the highlight of the National Day Parade in Singapore on August 9, 2017. Highlighting the major advances that Singapore has been able to pioneer in the field of robotics, Edgar is going to be sharing the limelight with more than 3000 other performers – some of them robotic, and some of them decidedly not – during the NDP festivities from the Marina Bay floating platform. Officially granted the title of Robot Host – the first of his kind in NDP history – Edgar is going to be adorned in blue and white “armor” and it won’t be difficult at all to spot him sending amongst the other 3000 performers. For human hosts are going to be responsible for helping Edgar pull off this amazing and historic feet, and it’s going to fall to Edgar’s shoulders to get the crowd excited to get the crowd pumped up, and to get the crown ready for the NDP parade which has become such a major part of Singapore these days. Representing a major breakthrough in artificial intelligence and robotics, Edgar has advanced programming that allows him to not only converse about nearly any topic imaginable (he can even give anyone advice as to where to find the best chicken and rice throughout Singapore, but he also has the ability to ad lib which allows him to formulate answers to questions that he has put to him in the course of a regular conversation. Though “born” only just 36 months ago, Edgar represents literally decades of science, research, and testing. Programmed by relatively young professors and scientists at the NTU facilities in Singapore, this unveiling is set to be something that the global community tunes into – if for no other reason than to see just how far robotics has come in the last few years and where it might be headed in the near future. Edgar is poised to have the world focused squarely upon Singapore in August, and it will be exciting to see what he is able to do and how he’s able to spur even more advancements in the field of robotics going forward! Morris Edwards is a content writer at CompanyRegistrationinSingapore.com.sg, he writes different topics like Robots are the Future of Business In Singapore and all topics related to Tech and Business, and if you need help on Setting up company in Singapore visit our website. ← Are Mainlanders Theft Targets in Europe?